Participatory plant breeding (PPB) is defined as a type of plant breeding in which farmers, as well as other partners, such as extension staff, seed producers, traders and NGOs, participate in the development of a new variety. In PPB programs farmers play a more important role than in conventional plant breeding (CPB). Both PPB and CPB are based on the same scientific background and are not mutually exclusive. This tool describes how to organize a PPB programme in self-pollinated, cross-pollinated and vegetatively propagated crops, how to design the trials, collect, organize and analyse the data, and eventually how to use and share the information generated by a PPB. 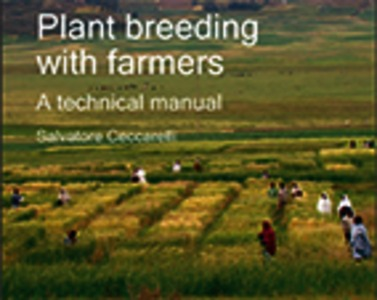 The manual is addressed to all those involved in planning and implementing participatory breeding activities. This includes research centres, universities, non-governmental organizations (NGOs), farmer associations and government extension officials. World food supply depends on few cultivated varieties. This has lead to a reduction of the agro-biodiversity. Participatory plant breeding introduce more actors into the variety selection process. This leads to an enhanced agro-biodiversity.